Finally, our cabinets have arrived. They took the full 4 months that was estimated when we put in our order. But at least they showed up on time. Contractor made short work of putting them up. Here is the kitchen in its semi-finished form. Pretty much all the cabinets are in except for the end panel that will be installed to the left of the island once the dishwasher is in place. Its still missing appliances, fixtures, sink, trim molding, hardware, countertops and the large panel that covers up the back of the island but this gives a good idea of what its going to look like. To give you a sense of the transformation, this is what it looked like a week or so before the cabinets got installed. And this is what the space looked like during the demolition (this photo is taken from the opposite side of the room) after the wall that made this space two rooms was taken out. After we ordered the cabinets but before they arrived, I was getting worried that maybe I had picked too yellow of a color or maybe the style wouldn't look right in there. 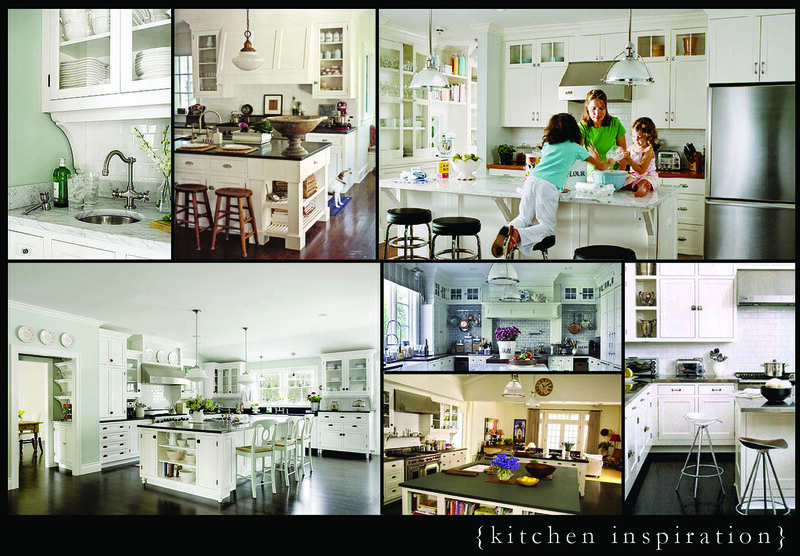 You can look back to an earlier post about the kitchen design but this photo collage of my inspiration kitchens can give you a sense of what I was going for. Obviously, I had a lot of limitations that these kitchens don't have but Im really happy with how its coming together. Now that we have the cabinets on their way, it was time to pick the counters. This decision has been much discussed since we started on the renovation. I fell in love with soapstone pretty early on but I know its a soft stone. I liked the idea of how it ages but its not for everyone. Most granite fabricators warn against it (but are also generally misinformed about soapstone properties so that sort of negates that "expert" opinion) Mr. Limestone wanted to stick with granite since we had experience with it. For a while I was going to give in and get black hones granite since it looks similar and is much harder. That was until I started reading internet reviews of black honed granite. After hearing about how it scratches, stains, and is impossible to keep looking good, I had enough of waffling. Soapstone it is. We took a trip this weekend to pick out the stone. Very exciting. The owner was very patient and pulled out various slabs until we found the one that had the veining I wanted without being too busy. Its a Santa Rita soapstone called "Black Venata"
For those wondering why part of the stone is gray and part is black - soapstone is gray green stone that gets darker over time. You can speed up the natural darkening process by oiling the stone with bee's wax or mineral oil. You can also leave it in its natural state and let it get dark on its own. The oil is not a sealer and is only for decorative purposes - soapstone is non-porous, it does not need to be sealed. While its not porous - it is much softer than granite so it develops a "patina" of wear...kind of like what you might see with old marble. Keeping fingers crossed that everything makes it to my kitchen in one piece. I can't wait for this part of the project to be finished! I am so glad you went with soap stone , just what your home needs, and my personal favorite, the cabinets are perferct.That is a dream kitchen. As for the Toronto shop prices they are pretty rich, and lots of people who live in Toronto are just that , but not this girl, there are great deals to find, depending on your style as well, luckily I have qwurky tastes. http://soapstonecounters.com/ this is my favorite inspirational spot for soapstone, someday I will upgrade to it here. One question, what is your backsplash going to be?? Thats a great kitchen. I wonder what kind of SS that is b/c it looks a lot more mottled and gray. Its probably a rare (read: more expensive) type. I have to make sure I have enough but I'd like the backsplash to be the tiles we salvaged from the upstairs bathroom (I posted about getting it off the wall very early last year). If we can't use that, I'll have to find something suitable. I love one of Ann Sacks mosaic patterns but its crazy expensive even for a small amt of space like mine. Nice kitchen -- that's exactly the scheme that's going into my soon to be renovated kitchen -- fairly simple white cabinets, glass upper doors, and a soapstone counter. May I ask what stone yard you used and how you liked it? anon - Im using soapstone from M Teixiera in NJ. The owner was very nice when we went to pick out slabs but until the stone is in place, I can't say if I like them or not. Ill give a full report once Im further along. We found your blog from Restyled Home...so much fun! Can't wait to see all of your progress! Wow. Simply wow. I love the soapstone, cant wait to see more pictures. Lovely home...I found your name through Kari & Kijsa..can't wait to see the progress !! Love the style and color of the kitchen cabinets. We are building a house and I want to pick the perfect white, but this is a big job. Can you give any details re: the color of your cabinets? I love to know about kitchen and services like kitchen Cabinets fitting and designing.